Hacienda de Vega’s Special Event Department creates events for groups of 25 guests or more and can host up to 500 guests on the entire property. There are various areas available depending on group size and desired menus. We offer a complete range of services for weddings, corporate functions, and celebrations with family and friends. Preferred vendors are available for party rentals, floral design, DJ, photography, entertainment and cakes among others. We strive to make this the perfect venue for your event in our inviting beautiful locale and its relaxing ambiance. Guests enjoy a truly unforgettable time while indulging in- authentic Mexican Cuisine. 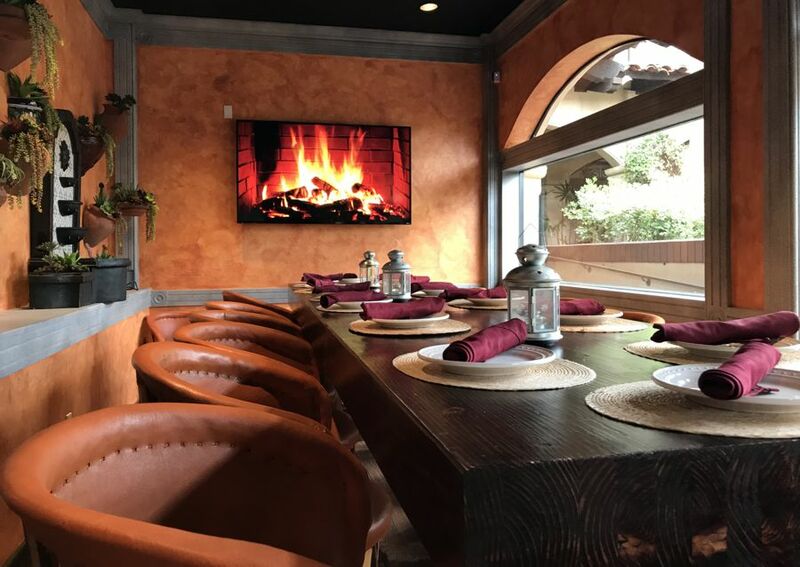 Our private room in our new Encinitas/RSF location is separated from the main dining room with sliding glass doors and has an independent entrance. It’s configuration is very flexible and features a round table for 10 guests. A running fountain makes this a very a cozy space and there is plenty of room for guests to get up and mingle. Custom Mini-Menu service available for groups of 25-40 guests. 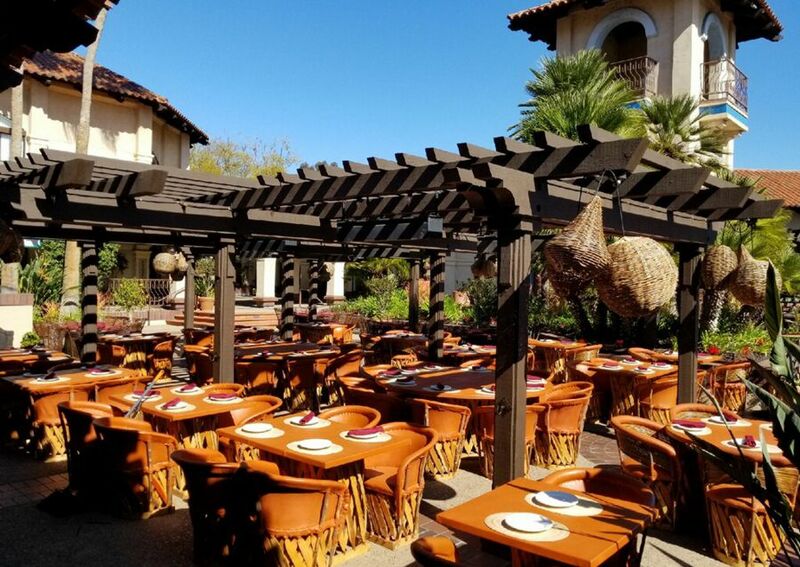 The patio is a in the Rancho Santa Fe Plaza is a true colonial beauty. Market lighting and fully heated, its trellis and greenery are surrounded by terracotta tiled roofs and a 40 ft. clock tower and multitiered fountains. Flexible table configurations, firepits and the option to expand to a large lower courtyard make this space the perfect setting for sit down menus as well as buffet menus for larger groups. The Family room is named for the intimate feel of this community table perfect for groups of up to 16 guests. A large screen TV allows for work meetings to collaborate or families to show slideshows. Succulent pottery and a 3 tier fountain complete this room with independent access right off the main dining room and is perfect for cocktails and appetizer menus as well as full menu sit-down gatherings. 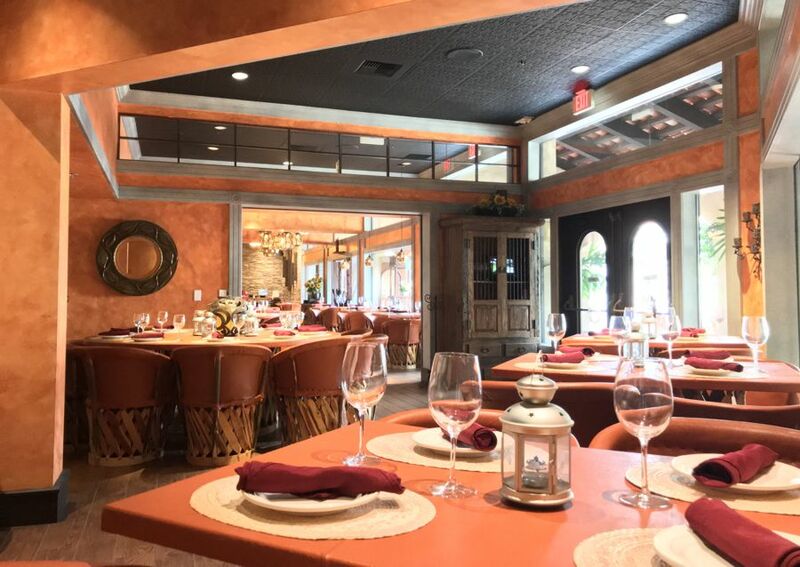 The private room in Carlsbad is a separate dining area away form the main courtyard. 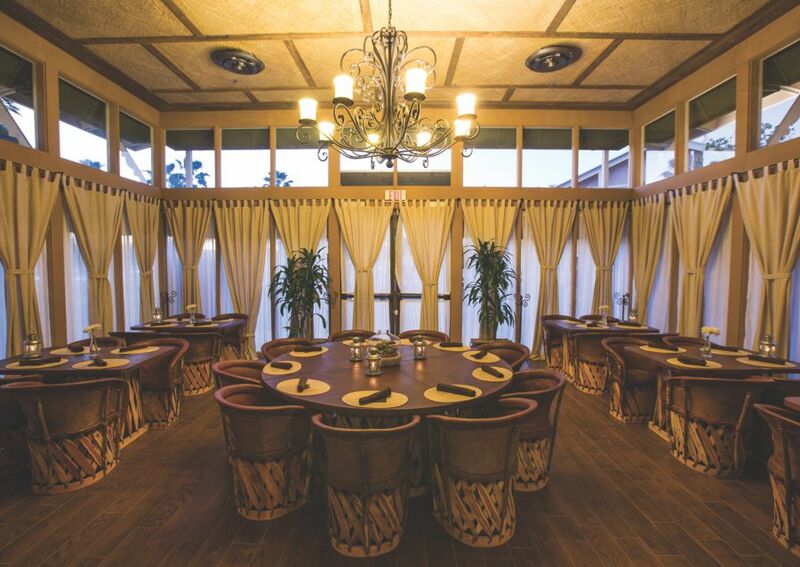 It features a large wrought iron chandelier and palm-grass ceiling overlooking a stunning, round table for 10 guests. It contains two 60" flat panels for viewing sporting events, video presentations or computer projection. This versatile room can be set up for sit down meals or appetizer-only menus (minimums required). The Private Room can accommodate up to 35 guests. 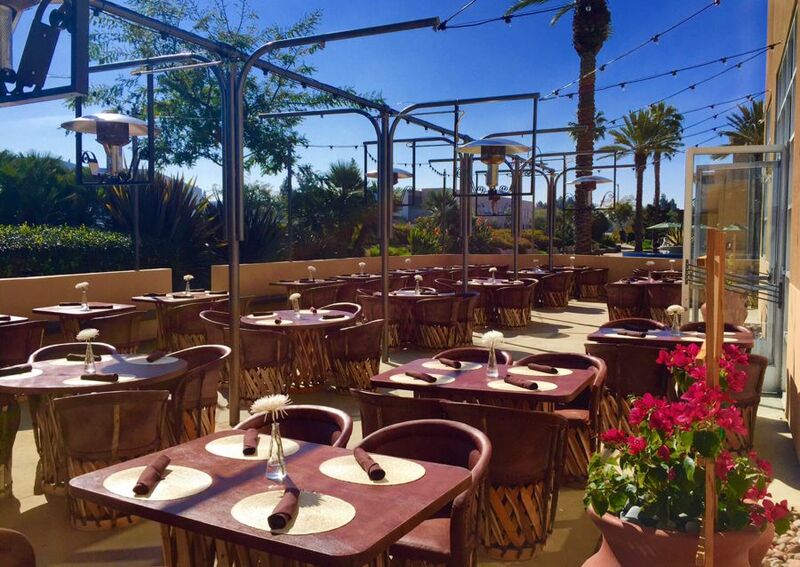 The patio in Carlsbad is a large, outdoor area perfect for happy hour events or formal sit down meals. Umbrellas available by day, market lighting and overhead gas heaters by night.The patio can accommodate approximately 100 guests, but sections can be reserved for smaller groups. Custom appetizer or mini menu service is available for groups of 25 guest or more. Buffet menus are provided for groups of 40 guests or larger. 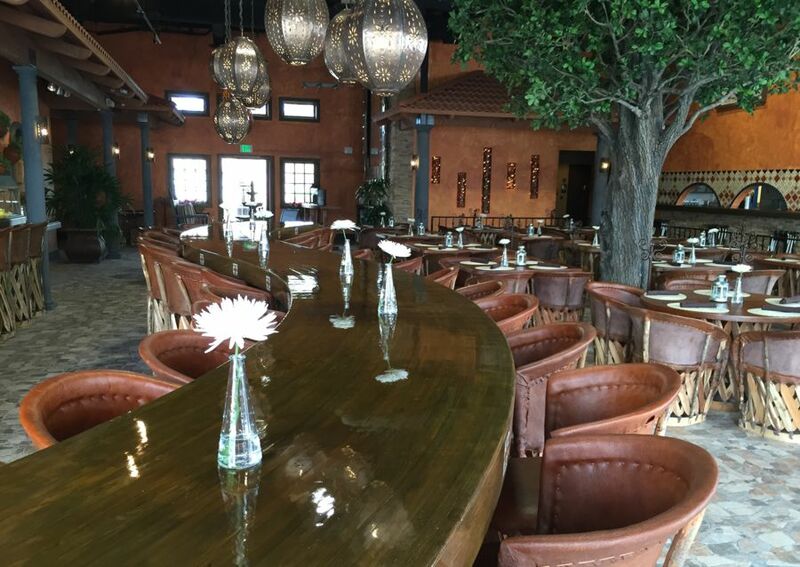 Our community table in Carlsbad is a beautifully crafted, 30ft. long, custom curved table located in the center of our indoor courtyard. It stretches parallel to our bar, in full view of the three 70inch large screen TVs and is the perfect mingling setting for groups wanting a more informal, cocktail and appetizer gathering. Full sit down, custom mini menus are also available for groups of 25 to 40 guests. Our special events kit contains all of the information you need to know to plan a successful event. It describes all of our different menu options, all of the various areas available our rental fees, policies and procedures. This is the perfect starting point, as it will answer many of your questions but, most importantly, spark some other very important questions that you may not have thought of yet. Based on the information you now know about planning your special event at Hacienda de Vega, this simple, one-page form will allow our Special Events Staff to prepare a preliminary proposal for you. Once this form is submitted, your desired event date will be held for a period of seven days to give you and one of our staff members to discuss the details, and customize your event. Your event proposal contains every single detail of your event. Once you are happy with how it all looks, sign and return your proposal with the appropriate deposit fees to secure and guarantee your event date. We understand that things change throughout the planning stages of all events, so we remain in contact with you to make adjustments. You can make changes to the menu, services and guest counts up to 14 days before your event date. At this point, you and our staff will work together to make final decisions.